St Margaret's Bay (Kent) - Fish: Mackerel, whiting, etc. Best Months: May to October. Boat-angling is best and catches include cod, whiting, conger and skate. From the beach the fish taken include whiting, scad, plaice, dabs, dogfish, bass and codling. January to April: plaice, flounders, dabs. May to September: dabs, pouting, bass, pollack. October to December: whiting, cod, pollack, pouting and dogfish. Prawns for bait are to be found to the east and west of the bay amongst rock pools and gullies. Prawning-nets are locally baited with kipper or small crab bodies. St. Margaret's Bay, Kent. Skate and conger are taken on fish baits by boat anglers, together with codling, pouting and flatfish. There is shore fishing with bottom gear baited with fish, crabs and worms. Float fishing for bass can be followed using live prawns which are found in rock pools at either end of the bay. Access to this bay is by a road which descends the face of a wooded chalk cliff in a series of hairpin bends. There is parking space at the bottom, close to the beach. The beach consists largely of shingle backed by a sea wall, but below the half-tide line there are scattered rocks in places; also weedy rock ledges which grow progressively more extensive towards either end of the beach. An inspection at low water will reveal that at many places these ledges are flanked by sand, enabling ground tackle to be cast out at various points. There is a reasonably snag-free area in front of the large dwelling at the northernmost end of the sea wall. Anglers have also taken dogfish and flatfish off the "knuckle" on the north side of the launching slipway. Some good bass are also present at times, and may be taken on peeler crab bait. Although one or two boats are kept at St. Margaret's Bay, none cater for rod and line anglers at the time of writing. Launching and beaching are far from easy owing to the numerous rocks which encumber the foreshore around L.W. immediately below the slipway. Car-trailed dinghies which are light enough to manhandle down the sea wall steps could be launched where the rocks are not so troublesome - but this bit of coast is not really suitable for small craft of this description. The tides run very hard (see cautionary notes under Deal), and anglers would be wise to fish only close inshore. Possibilities include trolling for bass around the rocky reefs. It is a wise precaution to choose the south side when the tide is flowing north, and vice-versa. In this way one is sure of having a favourable tide for the return journey. Peeler Crabs may be found at times among the weedy rock ledges. Piddock may be found at certain places in the soft rocks, and these make a good bait for whiting. The Kent coast offers some of the finest sea angling in the British Isles. Many species are encountered with cod predominant, particularly during the autumn and winter. The great advantage of fishing this coastline is that excellent fishing can often be had only a mile or two beyond the embarkation point. The North Sea, ebbing and flowing through the Straits of Dover, gives rather fierce tides, but the relatively shallow water compensates for this. Rarely is it over 14 fathoms deep, and is on average 7-10 fathoms. There is good fishing up the Thames as far as Gravesend and the Isle of Sheppey but this is estuary fishing. Open sea fishing begins at Whitstable. Whitstable is reached directly from London via the M2 and A299. The sea around this town is shallow for the first five miles out, and on average less than three fathoms deep. Boat anglers can expect to find dabs, whiting and cod in winter, and flounders, eels and bass in summer. Shore anglers enjoy beachcasting for the same species from the gentle shelving beach east of the harbour. Herne Bay lies 4 miles to the east of Whitstable still on the A299. Several available charter boats will take anglers to the famous Pansands for the excellent bass fishing in the summer, or to the broken ground off Reculver for winter cod fishing.The town was famous for its tope fishing before the war, but this species seems to have declined since then. The average depth here is about 3 fathoms until one reaches the shipping lanes nearly 7 miles out. Most varieties of seafish are caught in the appropriate seasons with thornback ray and smooth-hounds especially prolific during the peeler crab season in April, May and June. For the shore angler, fishing from the Eastern Promenade can be very rewarding, particularly in the autumn and winter after dark. Unfortunately the ¾ mile long pier was closed as being unsafe in 1968. The twin towers of the ruined church known as Reculver are 3 miles east of Herne Bay. The beach here shelves gently. and thornback and stingrays are caught during spring and summer and cod and whiting in autumn and winter. Shore angling is good for another 2 miles east of this landmark. Several charter boats are on hire from the harbour at Margate. The water here is 5-6 fathoms deep and the bottom, except at Margate Sands, is of chalk and flints, unlike the sand and gravel bottom at Herne Bay. Excellent bass and thornback ray are caught during spring and summer. The North Foreland Lighthouse is south-east of Margate, and the Elbow Buoy is approximately three miles out at sea from this point. Here one can expect the finest cod fishing to be had in the British Isles. Many dinghy anglers favour the Longnose Buoy which is nearer, being a mile offshore, and where similar catches can be made. During the summer, bass fishing is good off the inshore chalk ledges and artificial lures are very successful. In the town there is a stone jetty and promenades from which most varieties can be taken depending on the season. Broadstairs, on the A225 about 4 miles south-east of Margate, has a harbour where boats can be chartered to fish the same area as the Margate boats. Shore angling is possible from the harbour arm and from the chalk ledges north and south of the town. Ramsgate, south of Broadstairs, is on a direct route from London via the M2, A222 and A253. With its very large harbour and excellent boat facilities, it accommodates both individual and charter anglers. The boats fish as far as the Elbow Buoy, particularly in winter for the cod, at North Goodwins for thornback ray during the summer months, and at Quern Bank for the good bass fishing. 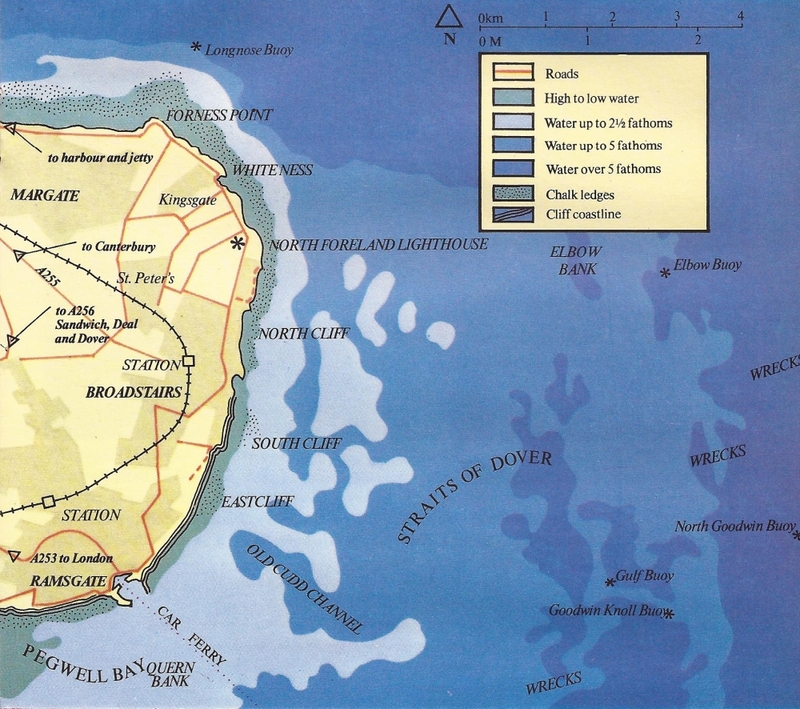 Pegwell Bay, which is a shallow water mark, is good for flatfish and whiting. Shore angling takes place from the harbour arms and a large variety of fish are caught although the ground is rather snaggy from the western arm. Large shoals of mullet abound inside the harbour during the summer months and can be caught on freshwater tackle. Other shore stations include the Chines and Under-Cliffe. Although Sandwich lies a mile inland from the coast there is a road through the sand dunes to the shore. The chalk of Ramsgate has now given way to sand and shingle and excellent sport can be had by the beach angler from this point. Big catches of cod are made during the autumn and winter, and mainly flatfish, including soles, through the summer. South of Ramsgate, and accessible via the M2, the A257 and the A258, Deal is the Mecca of sea angling. Large numbers of charter boats are launched from the steeply-shelving shingle beaches and just about every species of seafish has been caught at some time in these waters. A number of wrecks, particularly on the Goodwin Sands, provide good conger fishing, and in the summer tope and thornback are still caught in fair numbers over the sands. There is often good plaice fishing north of the town and south of Kingsdown, but the town's reputation is primarily for winter cod and whiting. Angling is allowed throughout the year from the modern pier and also night fishing at weekends. Kent Coast and the bottom is very hard chalk with fissures. Varne Bank, lying nearly half-way across the Channel, can provide good cod fishing throughout the summer with brill and turbot often a bonus. For the shore angler, the large harbour gives plenty of opportunity, although the eastern arm was closed to anglers many years ago. The Southern Breakwater is only accessible by boat, but a ferry service will take anglers for a nominal charge. Admiralty Pier is free fishing and anglers will often be shoulder to shoulder feathering for the vast shoals of mackerel found here during the summer. Folkestone Harbour, approximately 5 miles west of Dover, has charter boats which fish Varne Bank in summer and supply good inshore fishing in winter. Several of the inshore marks have 14 fathoms of water, and the sea bed is very rocky particularly off the Warren. Conger to 30 lb are not uncommon near the British Rail Harbour Arm where anglers may fish for a small charge. West of Folkestone, the first mile of shingle beach runs off to snaggy ground, and further westward gives way to sand. This beach extends for 4½ miles, and the road at the top known as Princes Parade enables one virtually to fish from the car. Many species are caught here including bass, conger, plaice, cod and whiting. West of Hythe are the Military Ranges, where fishing is prohibited except on special occasions. Dungeness is reached via the A259 to New Romney, then the B2071 out to the point. From Hythe to Dungeness the tide goes out so far that very little beachfishing is possible, but at Dungeness itself the steep shelving beach of shingle and the deep water make it ideal for the beach angler. Many years ago Leslie Moncrieff made this station famous for its cod fishing during the winter months. With the right conditions, anglers catch more cod than they can carry, and many of them are over 20 lb. In summer Dungeness and Dengemarsh provide excellent sole fishing and quite often large shoals of mackerel come right to the water's edge. Nearly all species of seafish are contacted; at one time there was even a small thresher shark caught from the beach here. There are some dramatic changes in the shore line as one works south along this section of the Kent coast. The rocky ground north of Ramsgate contrasts sharply with the shallow sands at Pegwell Bay. The water deepens slightly south of the Stour estuary, round the broad sandy sweep of Sandwich Bay, a place many anglers visit if sou'westerlies at Dungeness make fishing impossible. Around Deal, the beaches are steeper still, of shingle, mixed rock and sand below the water line, which in turn becomes very reefy if the South Foreland area. This continues round to Folkestone, becoming sandier at Hythe, and more shallow again at Dymchurch before the dramatic depths and tides at Dungeness Point. The water is deep along Denge Marsh but is shallower again at Camber and towards Rye Harbour. The main fish species caught from the shore are cod, flounders, dabs, pouting and whiting in winter; bass, conger eels, small tope, mackerel, scad, garfish, small pouting and whiting, plaice, sole, some cod and some dogfish in summer. Many of the locals fish for sole and bass in summer, big dabs and large cod in winter. Mullet are common in the harbours at Ramsgate, Dover, Folkestone and Rye and in the Stour and Rother estuaries. These are mainly thick-lipped, but thin-lipped mullet are found in the Rother and a few golden grey mullet are taken from the beaches. Boats from Ramsgate, Deal, Walmer, Folkestone, Dungeness and Rye Harbour all provide good fishing in winter for big cod until late December when huge sprat shoals move in and blot out everything but small bottom feeders. Offshore grounds provide good tope, spur dogfish, flatfish, some rays and black bream and smaller species in summer. The wreck fishing can be very good for medium pollack and ling and for good cod in summer. The Straights of Dover have several large sandbanks like the Varne, which also provide good cod and infrequent turbot fishing in summer. Slipways are available for those with boats on trailers at Broadstairs (4 hours before and after high water); Ramsgate harbour (not at dead low water); Deal Rowing Club; Dover (all states of the tide); Folkestone (all times); Sandgate, behind the rowing club; Princess Parade, Hythe, and at Rye Harbour (not at dead low water). The tides, especially to the north of Dover, run hard and in a confusing pattern. The visitor is advised to obtain expert advice for setting out. High tide times are 2½ (Deal) and 2¾ (Dover) hours before London Bridge. Tidal Streams are very complex. There are thriving sea angling clubs at: Dover SAA, 14 Priory Road, Dover (Tel. 01304 204772); Deal AC at 13 The Marina, Deal; Deal and Walmer AA at South Toll House, Deal Pier. A Plenty of blow-lugworm at Pegwell Bay. Dig it by trenching, but moat diggings to keep out surface water. Keep an eye open for hovercraft. Lots of good black lugworms which should be dug individually with a proper lugworm spade. 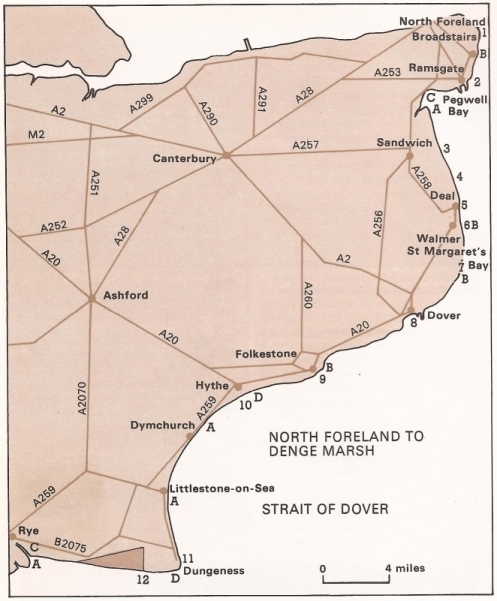 Dymchurch and Dungeness, Galloways and Rye. B Plenty of peeler crabs among the rocks in spring and autumn, also piddocks and rock worms here. C Small harbour ragworm from the Stour and Rother estuaries. D Storms often wash in large numbers of razorfish etc at Hythe and Dungeness. The usual species are taken on worm, crab and fish baits. It is not easy to fish from here around to Dover because of the rocky nature of the South Foreland. Plenty of reefs to explore for bass, and to troll over in summer for bass, small pollack and mackerel. It is difficult to generalize about the Channel in fishing terms, save to say that it is blessed by lying between the North Sea, noted mainly for its splendid winter cod fishing, and the warmer waters of the Western Approaches, where, besides ling, bass, pollack, coalfish and conger, there are numbers of the larger sharks and, from time to time, stray exotics like the sunfish. A mixture of North Sea and South-West species spreads throughout the Channel, but there is a marked influx of winter cod towards the eastern end, off Kent and Sussex, from October onwards. If the Channel has any one speciality, it is the shoals of bream which move to offshore stations during summer. What they lack in size, black and red bream make up for in spirit, quantity and edibility, and their arrival is eagerly awaited. The coast, with its famous resort beaches, is broken by numerous ports and harbours, and a huge choice of boat fishing exists. For the beach fisherman, night fishing, rock fishing and the remoter beaches give refuge from summer holiday crowds, as do the harbours and breakwaters. Tackle shops are numerous, and most supply bait in some form. Inshore trawling has made inroads into Channel fish stocks in recent years, with bass particularly suffering, but in general fishing is very rewarding. Fishing methods vary according to the location: harbours and jetties lend themselves to paternoster ledgering and float fishing, while spinning can be rewarding in both locations and from beaches and rocks. When mackerel shoals are close in, a trace of feathers thrown well out and drawn swiftly back near to the surface can sometimes give dozens of fish in minutes. On the gentler beaches long casting gives the best results, but there are good steep shores, like the immensely long Chesil Beach, where deep water lies close in. On most beaches, night fishing on a high tide is usually best. A range of baits is useful, lugworm and ragworm being the universal first choice, followed by fish strip, squid strip, peeler crabs and shellfish. Most of these baits are available at coastal tackle shops, with some worm grounds for digging your own (although this resource is diminishing as some grounds become worked out by professional and amateur diggers). The fish-monger is a useful back-up but catching mackerel for a boat trip is usually no hardship. Good shore fishing in St Margaret's Bay, especially for winter cod. Rocky South Foreland also productive. Tackle and bait available locally. Kingsdown and St. Margarets Bay are marks where rock anglers search for bass, cod and occasionally big conger eels. Kingsdown Butts, as its name suggests, is an army rifle range. Fishing is available when the Butts are not in use, with fishing from the cliff protection aprons. Essentially a venue of the autumn and winter, although not known nationally because of its constant use by the Army, local anglers spot that firing has ceased and take the opportunity to fish. Cod to 30lb have been caught from the Butts and in recent years a best conger of 52lb was landed in the autumn. Access is via the B2057 off the Dover to Deal road. The Butts fishes best at low water with peeler crab, yellowtail and occasionally a large squid bait being the most productive. Farther along the coast St. Margarets Bay offers similar conditions, although angling space is limited and not possible in summer when the venue is crowded with holidaymakers. To the west of Deal, marks off Kingsdown and Fan Bay, near Dover, are known for their good cod and plaice fishing within one mile of the shore. There are a considerable number of wrecks within easy reach of the Deal and Walmer boats, and hauls consist of cod, conger and pollack with feathers, pirks and artificial eels all scoring well, especially for the cod. Dinghy anglers should head for the Kingsdown SAC, where there's excellent launching facilities close to the Zetland Arms at Kingsdown. Inshore dinghy fishing under the White Cliffs of Dover is excellent for cod in winter and bass and plaice in summer.